The Analog Comparator compares the input values on the positive pin AIN0 and negative pin AIN1. 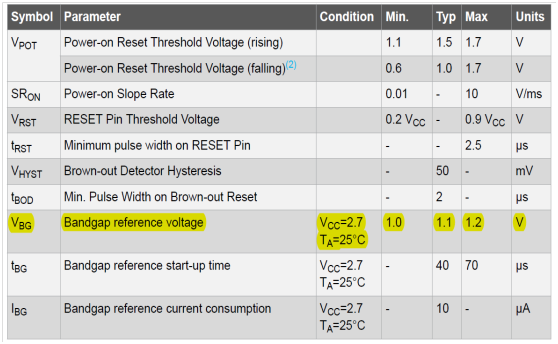 When the voltage on the positive pin AIN0 is higher than the voltage on the negative pin AIN1, the Analog Comparator output, ACO (on Port E), is set. The comparator’s output can be set to trigger the Timer/Counter1 Input Capture function. In addition, the comparator can trigger a separate interrupt, exclusive to the Analog Comparator. The user can select Interrupt triggering on comparator output rise, fall or toggle. A block diagram of the comparator and its surrounding logic is shown. The Power Reduction ADC bit in the Power Reduction Register (PRR.PRADC) must be written to '0' in order to be able to use the ADC input MUX. It is possible to select any of the ADC[7..0] pins to replace the negative input to the Analog Comparator. The ADC multiplexer is used to select this input, and consequently, the ADC must be switched off to utilize this feature. If the Analog Comparator Multiplexer Enable bit in the ADC Control and Status Register B (ADCSRB.ACME) is '1' and the ADC is switched off (ADCSRA.ADEN=0), the three least significant Analog Channel Selection bits in the ADC Multiplexer Selection Register (ADMUX.MUX[2..0]) select the input pin to replace the negative input to the Analog Comparator, as shown in the table below. When ADCSRB.ACME=0 or ADCSRA.ADEN=1, AIN1 is applied to the negative input of the Analog Comparator. The Store Program Memory Control and Status Register contains the control bits needed to control the Boot Loader operations. When addressing I/O Registers as data space using LD and ST instructions, the provided offset must be used. When using the I/O specific commands IN and OUT, the offset is reduced by 0x20, resulting in an I/O address offset within 0x00 - 0x3F. When this bit is set, the analog comparator output is connected to the ACO pin. When addressing I/O Registers as data space using LD and ST instructions, the provided offset must be used. When using the I/O specific commands IN and OUT, the offset is reduced by 0x20, resulting in an I/O address offset within 0x00 - 0x3F. When this bit is written as logic one, the power to the Analog Comparator is switched off. This bit can be set at any time to turn off the Analog Comparator. This will reduce power consumption in Active and Idle mode. When changing the ACD bit, the Analog Comparator Interrupt must be disabled by clearing the ACIE bit in ACSR. Otherwise, an interrupt can occur when the bit is changed. Comparator. When this bit is cleared, AIN0 is applied to the positive input of the Analog Comparator. When the bandgap reference is used as input to the Analog Comparator, it will take a certain time for the voltage to stabilize. If not stabilized, the first conversion may give a wrong value. The output of the Analog Comparator is synchronized and then directly connected to ACO. The synchronization introduces a delay of 1 - 2 clock cycles. This bit is set by hardware when a comparator output event triggers the interrupt mode defined by ACIS1 and ACIS0. The Analog Comparator interrupt routine is executed if the ACIE bit is set and the I-bit in SREG is set. ACI is cleared by hardware when executing the corresponding interrupt handling vector. Alternatively, ACI is cleared by writing a logic one to the flag. When the ACIE bit is written logic one and the I-bit in the Status Register is set, the Analog Comparator interrupt is activated. When written logic zero, the interrupt is disabled. When written as logic one, this bit enables the input capture function in Timer/Counter1 to be triggered by the Analog Comparator. The comparator output is in this case directly connected to the input capture front-end logic, making the comparator utilize the noise canceler and edge select features of the Timer/Counter1 Input Capture interrupt. When written logic zero, no connection between the Analog Comparator and the input capture function exists. To make the comparator trigger the Timer/Counter1 Input Capture interrupt, the ICIE1 bit in the Timer Interrupt Mask Register (TIMSK1) must be set. These bits determine which comparator events that trigger the Analog Comparator interrupt. When changing the ACIS1/ACIS0 bits, the Analog Comparator Interrupt must be disabled by clearing its Interrupt Enable bit in the ACSR Register. Otherwise, an interrupt can occur when the bits are changed. When this bit is written logic one, the digital input buffer on the AIN1/0 pin is disabled. The corresponding PIN Register bit will always read as zero when this bit is set. When an analog signal is applied to the AIN1/0 pin and the digital input from this pin is not needed, this bit should be written logic one to reduce power consumption in the digital input buffer.